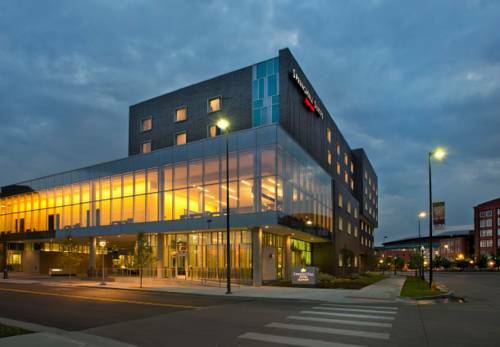 Stylish, functional, and contemporary, Springhill Suites Denver Downtown provides the perfect backdrop for business trips and fun family vacations. Located in the vibrant LoDo section of Denver, we have the proud distinction of being the first LEED Gold hotel in the city. Our upscale suites boast 25% more space than comparable hotel rooms. Free Wi-Fi access throughout the hotel enables you to stay focused and connected whenever you want. Plush bedding and amenities including an in-suite mini-fridge and microwave add comfort and flexibility to your stay. Fuel up with a delicious free breakfast before starting your workday or exploring Downtown Denver. Looking for a Downtown Denver wedding or event venue? Our hotel offers over 2,000 sq.ft. of event space. Enjoy a workout in our state-of-the-art fitness center. Our Downtown Denver hotel rooms are just minutes from the Pepsi Center, Sports Authority, Elitch Gardens, Larimer Square, Coors Field and Union Station. Enjoy a globally-inspired menu is thoughtfully sourced featuring local Colorado meats, ethically-caught seafood, and produce from within 90 miles. Three free beers per adult -- and a fascinating tour, of course. A sign proclaims that this unheralded spot is where the transcontinental railroad REALLY linked up. Santa's been at this North Pole on the slopes of Pikes Peak since 1956. Lots of kiddie rides, holiday-themed characters, and a perpetually frozen Pole.